This article provides you an introduction Shared Hosting from Bluehost and briefly reviews features and prices, and Bluehost coupons. These are all based at the time of my review and they may change over time. However, having followed this company over a number of years I know that these do not alter massively. The company offers VPS and Dedicated server hosting, which will be reviewed in a different post. Bluehost offers 4 plans for their shared hosting. The Basic Plan.The Basic Plan is the cheapest at $ 3.95 per month (reduced from $7.99). It allows you to host only one website. With this plan, you will enjoy unmetered bandwidth plus 50GB web site space which is ideal for a small website or blog. It also comes with 5 email accounts with 100MB for each account. The plan also offers 5 parked domains and 25 subdomains. It’s an excellent choice if you have a small business. The Plus Plan. The Plus Plan is an excellent choice if you have multiple websites/blogs that you would like to host. This is good if you are, i.e. a web designer, and you are hosting a lot of small websites on behalf of your clients. The plan offers unmetered website space and unmetered bandwidth. Unlike the Basic Plan, the Plus Plan offers an unlimited number of email accounts with 100MBs for each account. Also, included in this plan is one domain and an unlimited number of parked domains, and sub domains. Additionally, it comes with marketing vouchers worth $200. This is in the form of Google AdWords and Bing coupon codes. This plan is also quite affordable at only $ 5.95 per month. The Prime Plan.The Prime Plan is also ideal if you need to host several websites. At a reduced price of $5.95, this plan allows you to host an unlimited number of websites and offers unmetered website space and, band width. The Prime Plan comes with “SiteBackup Pro”, a solution which allows for automatic online backups and restorations. The plan also offers you an unlimited number of emails for use on multiple websites with 100MBs per account. It’s also a great choice for the large business that requires the use of more than 5 email addresses. Included in the plan is one domain and an unlimited number of parked domains and sub domains. If you purchase the plan, you will also be getting $200worth offers absolutely free. Go Pro Plan. Bluehost also has a special hosting plan known as Go ProShared Hosting.At only $13.95 per month, you get everything else offered in the Prime Plan plus incredible features including Dedicated IP, SSLCertificate, Site Backup Pro, and Domain Privacy. This plan is ideal for small businesses that wish to have a website that is faster and more reliable in terms of uptime. If your demands a very high and you require more speed and reliability then you need to be looking at a VPS hosting plan or a Dedicated Hosting Plan. These are also available on Bluehost but I will review them in a different article. Bluehost usually do not provide discounts in the form of a BlueHost coupon code. At the time of my review, they priced price their Basic Hosting plan down from $7.99 to $3.95 which is 50% off! The discount was valid for the first year of hosting. However, when you are at Bluehost's check out, browsing using Firefox, try clicking the back button. I did that and Bluehost brought a discount pop up. All I had to do was to click “claim the savings” for the new price to apply at checkout. This reduced the price even further from $3.95 to $2.65 per month. 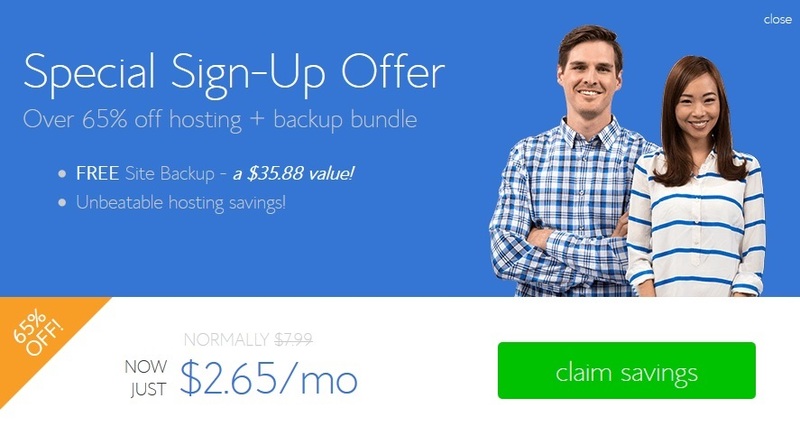 That is a massive discount of 65% off hosting band backup; all a new website owner wants to start a new site. For the latest coupons for Bluehost.com visit www.webhostingology.com/bluehost-coupons/.